Assam APSC Jr. Administrative Assistant Recruitment 2017: Assam Public Service Commission APSC welcomes application forms through offline from talented/ willing candidates for the post of Junior Administrative Assistants. Total available vacancies in this APSC Recruitment are 12 posts. Interested candidates have to go through the Assam PSC official website www.apsc.nic.in to download the application form. Candidate must write the name of the post on the cover of application form and should be addressed to the Secretary, APSC. Last date for receiving application form is 01-12-2017 during office hours. Minimum age of the candidate is 18 years and maximum age limit is 43 years as on 01-01-2017. Pay scale for this APSC Jr. Administrative Assistant Jobs is Rs.14,000/- to Rs.49, 000/- plus Grade Pay Rs.8700/- plus other allowances admissible as per Rules. Candidates will be selected for this APSC Recruitment is based on their skills in written test, Computer Practical Test and Viva-voce/ Interview. Examination fee for general category is Rs. 250/- and for SC/ ST candidates is Rs. 150/-. 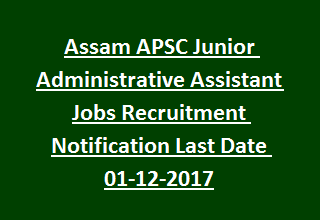 Full details of Vacancies, Notification dates, written test pattern, Application filling procedure, educational qualifications regarding Assam Public Service Commission APSC Junior Administrative Assistant jobs Recruitment are given below. Available vacancies in Assam Public Service Commission APSC Recruitment are 12 posts. Name of the post: Junior Administrative Assistant: 12 posts. Applicant must be a graduate in any stream (Arts, Science & Commerce) with minimum 45% marks for General/ OBC candidates and 40% marks for SC/ ST candidates from recognized University. Diploma or certificate course in Computer Proficiency for a period of minimum 06 months from recognized Institute and must have working knowledge on office productivity software tools. Applicants should have minimum age is 18 years and maximum age limit is 43 years as on 01-01-2017. Upper age relaxation for SC/ ST is 05 years. Pay scale for Jr. Administrative Assistant Jobs is Rs.14,000/- to Rs.49, 000/- plus Grade Pay Rs.8700/- plus other allowances admissible as per Rules. Candidates will be selected for this APSC Recruitment is based on written test, Computer Practical Test and Viva-voce/ Interview. Written test consists of OMR based multiple choice questions on General English, General Studies and Precis writing. Total marks are 175 and the time duration is 3 hrs. -Computer Practical Test: total marks are 25 and candidate should secure 40% marks out of 25. Qualified candidates in Computer Practical Test will be sent to Interview/ Viva- voce. Final merit will be made on the basis of marks secured in written test and Viva- voce/ Interview. Candidates having BPL certificate application fee is Nil. Download the application form for Jr. Administrative Assistant Jobs in APSC Recruitment using the official website www.apsc.nic.in. Last date for receiving applications to the Secretary, APSC is 01-December-2017.